Because so little documentation exists on Carr China, it is often difficult to identify patterns, body styles and ink colors. Deciphering a found sample plate (below) yields some helpful information, especially when compared to a Carr salesman's reference book. While these books are rare, they are known to exist and we will share some of what we can attain on this site. We welcome anyone with access to more detailed information to share your knowledge with all collectors on this site! 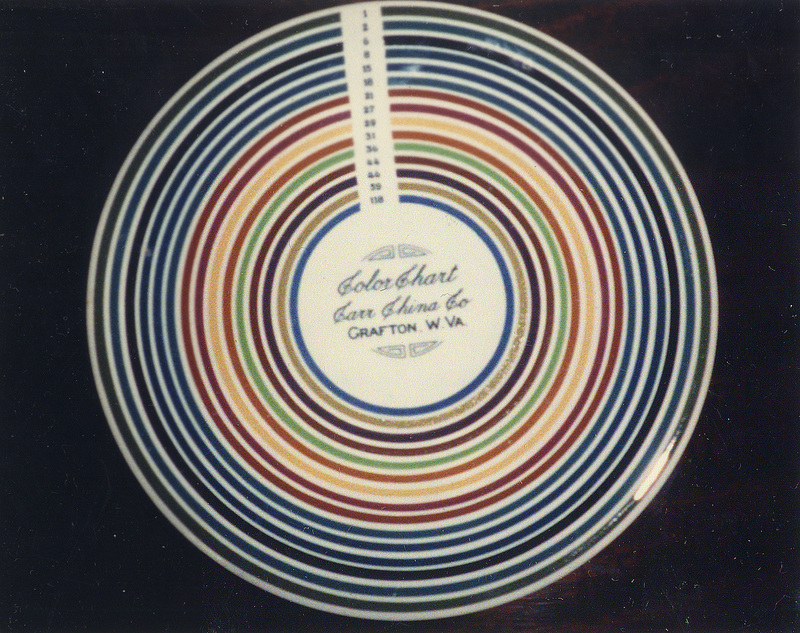 This plate is a color sample chart created for use by Carr's sales representatives to assist customers in making custom color selections. 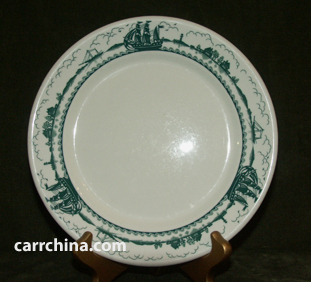 The reverse of this plate contains the color key and names used. The Marine pattern is one of Carr's more elusive patterns. It features an elaborate border design of two- and three-mast tall ships, a shoreline of lighthouses, homes and rolling hills, a sky filled with clouds and birds in flight and delicate rolling waves. The Carr family were avid boaters and enjoyed the ocean shore. Family homes were in Vineyard Haven, Massachusetts and St. Petersburg, Florida, among other locations. 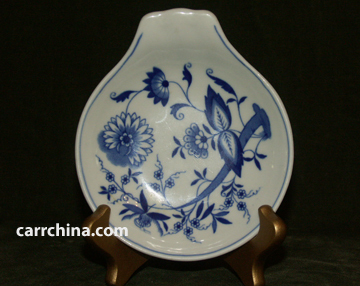 This lovely dish is a Carr ice cream shell in the beautiful Blue Onion pattern. It is a delicate dish and made for an attractive way to serve ice cream. This shape is rather rare, making it a valuable find for the lucky collector. The ice cream shell was made on both the white and Glo-tan body.